Sagittal spine and pelvic alignment of adolescent idiopathic scoliosis (AIS) is poorly described in the literature. It generally reports the sagittal alignment with regard to the type of curve and never correlated to the thoracic kyphosis. The objective of this study is to investigate the relationship between thoracic kyphosis, lumbar lordosis and sagittal pelvic parameters in thoracic AIS. 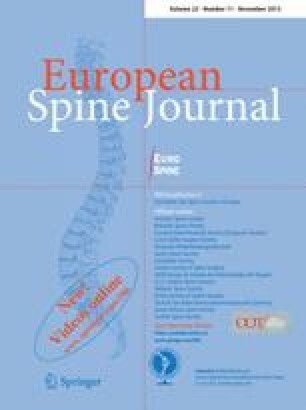 Spinal and pelvic sagittal parameters were evaluated on lateral radiographs of 86 patients with thoracic AIS; patients were separated into hypokyphosis group (n = 42) and normokyphosis group (n = 44). Results were statistically analyzed. The lumbar lordosis was lower in the hypokyphosis group, due to the low proximal lordosis. The thoracic kyphosis was not correlated with any pelvic parameters but with the proximal lordosis. The pelvic incidence was correlated with sacral slope, pelvic tilt, lumbar lordosis and highly correlated with distal lumbar lordosis in the two groups. There was a significant linear regression between thoracic kyphosis and proximal lordosis and between pelvic incidence and distal lordosis. We can consider that the proximal part of the lordosis depends on the thoracic kyphosis and the distal part depends on the pelvic incidence. The hypokyphosis in AIS is independent of the pelvic parameters and could be described as a structural parameter, characteristic of the scoliotic deformity.